This makes code much more readable as you don't have to read inside out, but can read from left to right. Also the discoverabilty of available features via content assist works much better. But of course using static methods all over the place is problematic, as you bind your code to the implementation which makes it hard to test and to reconfigure for different situations (e.g. use a different database system). In Xtend you can put the extension keyword to a local field or a parameter. 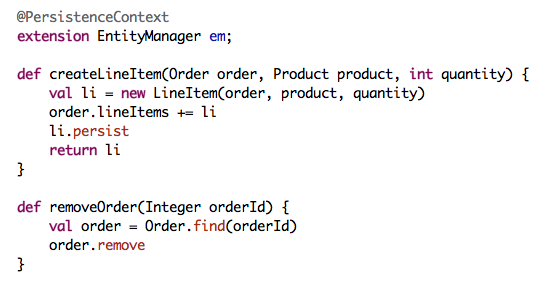 This will make its instance methods available on the first parameter's type. I'll explain that with an example using JPA and Java EE. Extension provider allow for adding layer specific functionality to any classes in a non-invasive way. And you don't have to use static methods for that. When designing an API, you can make it very easy for the clients to have the right extension providers on the scope. If you don't like inheritance that much, another approach is to mark a parameter of an abstract method with the extension keyword. When implementing that method, the IDE will automatically add the extension keword for you. The active annotations API uses that idiom. Note that in case you define the abstract class or the interface in Java, you can add the @Extension annotation instead of the keyword.